Will There Ever Be a Booze That Gets You High? There’s weed vodka and a host of terpenes that function like bitters, but will cocktails ever get psychoactive? I first met Hunsinger when he was tending bar at a “Cannabis and Caviar” event I attended last month celebrating the launch of High End Creatives, a cannabis consulting firm and creative agency. His bar program was certainly the highlight of the evening. We were at Clark Gable’s 1928 home in the Hollywood Hills, and the moon was nearly full as it shone above Hunsinger’s outdoor setup. He was making lemon drops mixed with True Terpenes (and weed vodka), among other drinks, including a champagne topped off with a different True Terpene offering. Speaking of larger and ever-evolving conversations: Even though Constellation Brands, the corporation behind Corona, Svedka and a number of other alcohol lines, is behind the largest investment in any cannabis business in history — investing $4 billion in Canopy Growth, a Canadian, publicly traded cannabis company — the marriage between the booze and industries isn’t exactly what you’d expect. The liquor industry recognizes that Americans are drinking less beer and voting in favor of progressive pot laws at a rapid rate, but by and large, cannabis is entering the alcohol space not in hopes of increasing a consumer’s level of inebriation, but instead, enhancing the flavors consumers get to experience. Terpenes aren’t regulated in the same way as cannabis and aren’t at the forefront of the normalization and legalization conversations, so having major players interested in entering the space could seriously influence future regulation on using these compounds as flavoring, especially amid a culture increasingly interested in natural flavorings as opposed to synthetic ones. Just to be clear, too, terpenes alone don’t get you high. (They interact with THC and CBD, and together an “entourage effect” is produced, meaning even when the individual compound isn’t psychoactive, it informs the overall effects produced when someone ingests the plant.) That’s why the terpene cocktails Hunsinger made me didn’t give me any effects besides being typically tipsy. That’s also why the Humboldt’s Finest Cannabis Vodka he used in them didn’t differ much from any other fine, small-batch booze. 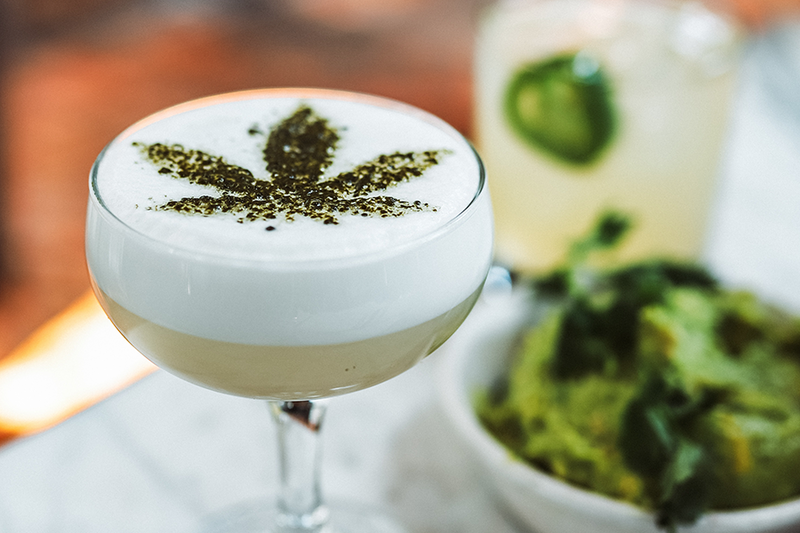 In other words, cannabis is about to take up more space in the food-and-beverage industry, but as a natural provider of a variety of flavors, not as something that gets you high. Luckily, you can always bring your own THC-tincture and dose yourself.